A few weekends back I played a game of I Ain’t Been Shot Mum (IABSM) using 6mm models and I absolutely loved it. It looked really good and the fact that the ground-scale and figure-scale were the same at 1:300 really seemed to add something to the game. So whilst getting together a big order for Ros-Heroics for me and some friends I’ve been making scenery, in particular bocage hedges. About twenty feet made so far, with another six feet almost finished. The eventual target is sixty feet at least. Here’s some pictures. And, just to continue my current obsession with all things bocage, I’ve put together a few web pages outlining some of the thoughts that lie behind how I chose to make my terrain. And I have a bit of a go at what I call Mocage, wargames terrain that bears little resemblance to the real thing. I’ve now posted a tutorial showing how I made the hedges. Very nice!! I´ll try it for my 10mm figurines. I’ve got a load of 10mm stuff for France 1940. 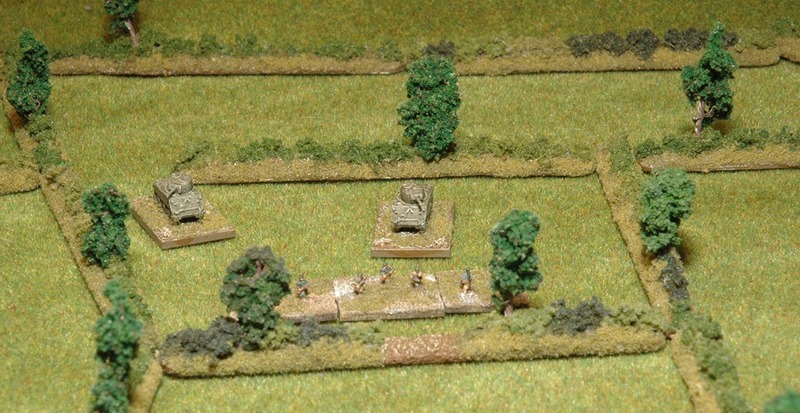 6mm bocage for Normandy, 1944, will work just fine as 10mm hedges for France 1940.